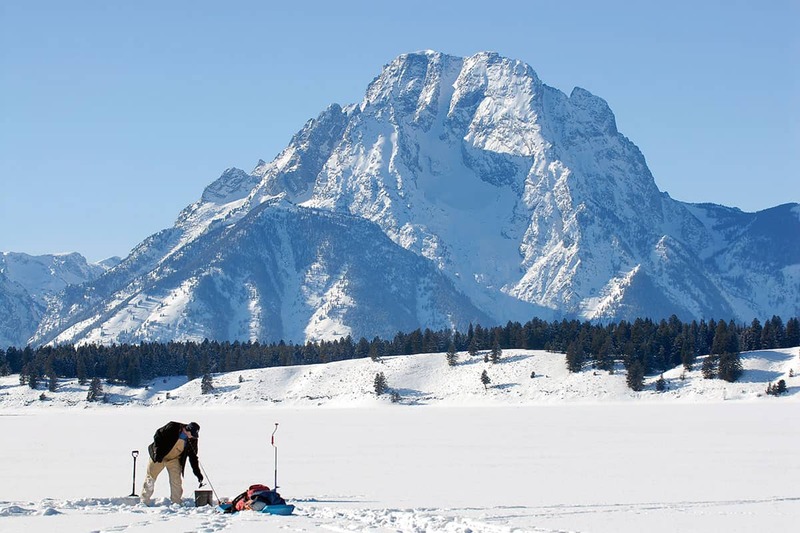 Ice fishing on Jackson Lake can be a chilly affair, but the view is unparalleled. THE PROSPECT OF standing on two feet of barren ice, peering down into an eight-inch hole in the grip of frigid temps and hoping for the best, became more alluring to Chris Colligan when he had few other options. A backcountry snowboarder who has taken on seldom-carved lines in places like Mount Moran, the native Michigander was raised ice fishing. In his early years in Jackson, he occasionally pursued trout atop a frozen lake, but never made it a regular part of his life. Then, he fell while snowboarding and tore the ligament connecting the bones of his thumb. (Its severity became clear when Colligan couldn’t hold a drink.) The injury would necessitate surgery, and derail his season on the slopes. … think old men sitting on a five-gallon pail, bored and bickering, with a light domestic beer in hand just as often as their fishing rods. But ice fishing in Jackson Hole is vastly more interesting than that. “I joked about it. I had a pin going through my thumb, and I called it my lake trout detector,” says Colligan, a decadelong valley resident who works in the conservation nonprofit world. “It was supercold fishing with that piece of metal going into your thumb and your bone.” The hardship aside, a couple months of heavy time on the ice hooked him onto Jackson Hole’s underappreciated ice-fishing opportunities. Fishing two holes is more work, but it increases the odds you’ll catch something. FOR THE TYPICAL valley resident and visitor, ice fishing is lost in the shuffle of wintertime activities: downhill, backcountry, cross-country and skate skiing, along with snowshoeing, snowmobiling, and even fat biking. Perhaps the caricature of the sport in the Midwest, where shanty towns appear on frozen lakes and it’s big business, doesn’t help its popularity: think old men sitting on a five-gallon pail, bickering and bored, with a light domestic beer in hand just as often as their fishing rods. But ice fishing in Jackson Hole is vastly more interesting than that. 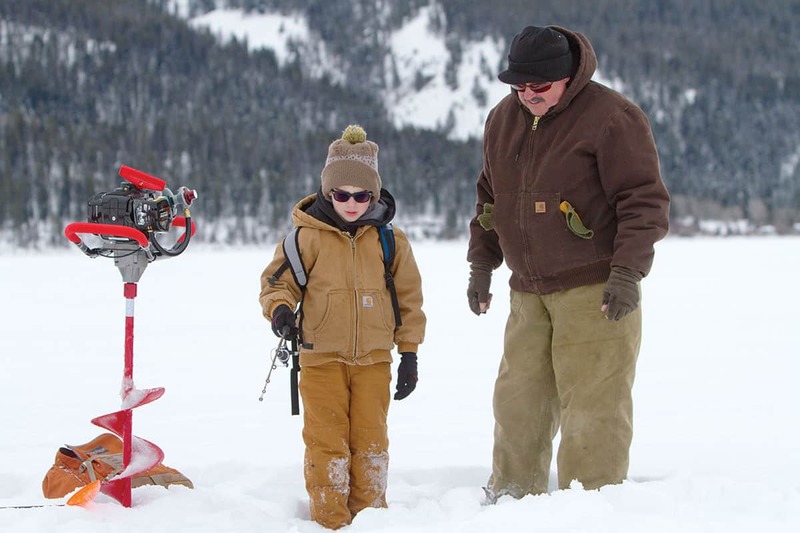 Plunking a silver spoon or jig head into the icy waters of Jackson and Lower Slide lakes is a wintertime activity that’s steeped in history, unites families and friends outdoors in beautiful places, and—if you know where and when to carve out a hole and what to tie on the line—can make for top-notch fishing. “I look forward to it more than any other type of fishing that I do,” says Andy Asadorian, a Victor, Idaho, resident and WorldCast Anglers guide. “And I’ll fish for anything, with any rod.” To Asadorian, there’s a mystique about spending a day on top of a frozen lake at the base of the Tetons. The typical outing for the fishing guide is a social one, complete with good eats—the freshest of fish tacos have been had. But he also has days of solitude. There have been plenty of winter days on Jackson Lake, the most popular of local ice-fishing spots, where he hasn’t seen one other angling party. Mike Braghini and Keith McCoy watch their electronic fish finders as they fish for trout on Slide Lake. “It’s a wonderful thing when man can walk on water,” McCoy says. 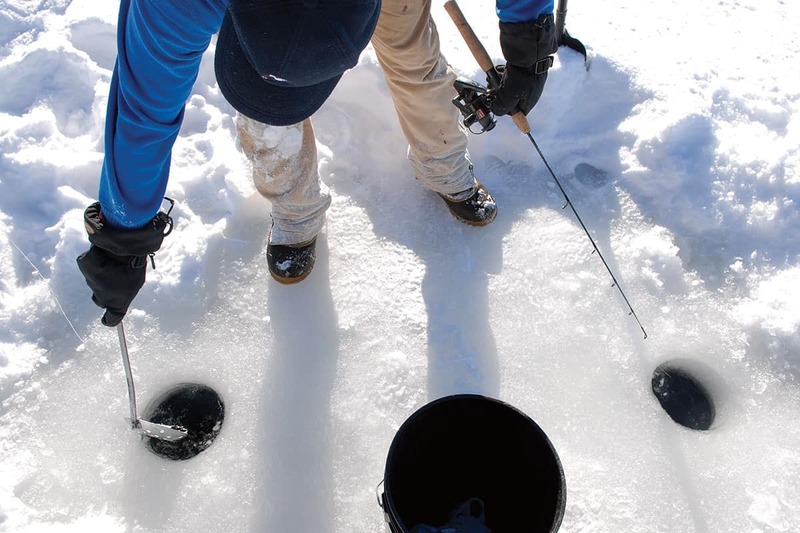 THE POPULARITY OF ice fishing in the valley has dwindled over the decades. 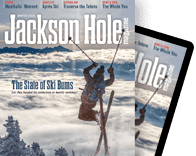 Two primary developments have dampened local participation: the evolution of cold-weather fly-fishing gear and Grand Teton National Park’s 2003 prohibition of “snowplanes” on Jackson Lake. The former allows anglers to stay warm(er) while plying always-open rivers with nymphs and streamers. Now, even in the depths of winter, you can fish places like the Snake and its South Fork. “Neoprene waders came out and changed the whole game,” valley resident and avid ice angler Joe Burke says. “Before, you’d get out there and you wouldn’t be able to feel your feet for a week.” The snowplane prohibition addressed vehicles that aren’t aircraft in the conventional sense. In the second half of the twentieth century—the valley’s ice-fishing heyday—more than one hundred of the propeller-driven tracked vehicles had permits to cruise over the frozen surface of the fifteen-mile-long body of water. The snowplanes were tightly tied to ice fishing, recalls Wyoming Game and Fish Department regional fisheries supervisor Rob Gipson. “They were only used to fish,” Gipson says. “I don’t know of anybody who used one for just tooling around.” After the snowplane ban thirteen years ago, the Jackson Lake ice-fishing scene “didn’t have the same feel,” Gipson says. Snowplaners, oftentimes Idahoans and residents of elsewhere in Wyoming, stored their machines, along with campers, at Colter Bay for the season. They drove to Jackson Lake and stayed most weekends, snowplaning from fishing hole to fishing hole during the day and recovering in their campers at night. Jackson Lake ice fishermen can still use snowmobiles to move around (fishing access is the only acceptable use of snowmobiles on the lake) but it seems that part of the appeal of ice fishing there was the novelty of using a snowplane to move across the lake. Most of the former snowplaners stopped ice fishing rather than switch to sleds. DESPITE THE RELATIVELY slim crowds out on the ice nowadays, the fishing can be stellar. “I think it’s world-class,” Asadorian says. While that description may be Homer-driven hyperbole, fisheries biologists confirm that the lake trout (mackinaw) are available for the taking. The limit is six, with no more than one measuring over twenty-four inches. Averaged across all of last winter on Jackson Lake, anglers hauled in about 0.6 lake trout an hour—not gaudy, but enough action to keep fishermen on their toes. Run into someone on the ice and there’s a good chance it’ll be a longtime Jackson Hole ice fisherman who can teach you some tricks of the trade, which are not given up willy-nilly. Several old-timers I reached out to declined to be interviewed, not wanting to disclose their secrets. To the most fanatical of ice anglers, the sport can be gear-intensive and a drain on the wallet. Peruse a Cabela’s catalog and you’ll find an impressive collection: powerful and pricey ice augers, underwater cameras, fish-finding sonar, ice-fishing-specific rods and reels, and accessories ranging from an “outdoors portable beverage holder” to ice chaps and portable heaters. It wasn’t always such a gear-intensive endeavor, Burke recalls. “We used to get a couple of sticks off the shore and stick them in the hole so we could see where it had been the week before,” he says. ON OTHER OCCASIONS, Colligan’s had epic fights not with fish but with the elements. There’s the biting bitter cold and blinding, blowing snow that can produce the same disorienting effect skiers tackle on top of the aerial tram at Jackson Hole Mountain Resort. Rare wintertime thunderstorms have caused his fishing rods to buzz with static electricity, and on more than one occasion Colligan has broken through the ice in the early season. Frozen pants on such days, he says, feel like you dressed yourself up in stovepipes. “There’s an adventure element to it that I guess people probably don’t understand,” he says. While Jackson and Lower Slide lakes are the only viable drive-up ice-fishing options in the valley, for those with a willingness to glide or tromp over the snow to get there, there are more choices, like Jenny, Phelps, and Leigh lakes. Lakes holding only Snake River fine-spotted cutthroat are best avoided, because the native trout species is notoriously apathetic about eating under the ice. But there are plenty of lakes with lake trout, a species that was introduced here and that tends to remain active and forage through the winter. Lakes on the east slope of Togwotee Pass like Torrey Lake and parts of the Brooks Lake watershed and the Finger Lakes at the western base of the Wind River Range are mackinaw fisheries. 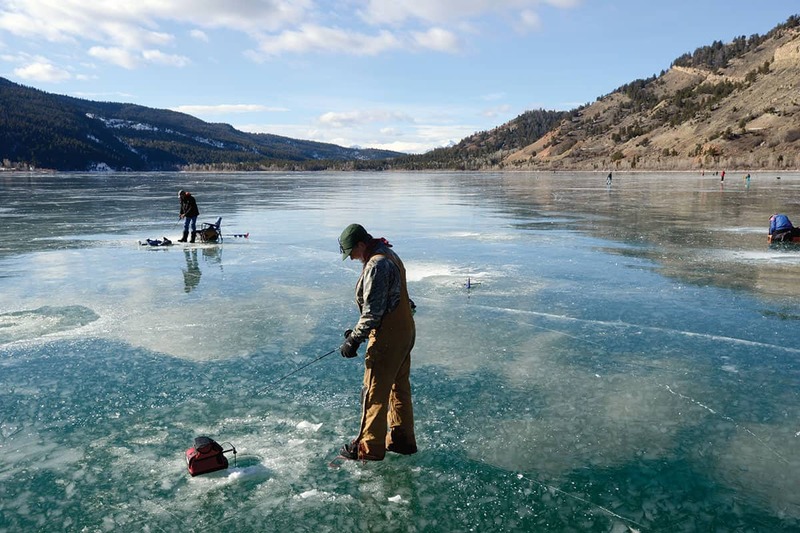 If you want to be part of a true ice-fishing scene, drive five hours to Flaming Gorge or Boysen reservoirs, where there are some warm-water species in addition to trout, and plenty of other anglers around. If you have a snow machine, Green River and Grassy lakes are options and have solid stocks of trout. Yellowstone’s Lewis, Shoshone, and Yellowstone lakes are fishable, but because of the scarcity of wintertime permits authorizing solo snowmobile access into the park, anglers are rarely seen on the ice of these lakes. The Teton County 4-H Sportfishing Club hosts annual adventures to Lower Slide Lake to turn kids on to the activity. Run into someone on the ice and there’s a good chance it’ll be a longtime Jackson Hole ice fisherman who can teach you some tricks of the trade, which are not given up willy-nilly. Several old-timers I reached out to declined to be interviewed, not wanting to disclose their secrets. They were sad there was an article being written about ice fishing at all—most see the activity in general as secret.